What, you say? I thought I was supposed to keep those most frightening of allergy-inducing legumes as far from my vulnerable offspring for as long as humanly possible. Well, dear parents, as reported by NIH, AAP and countless others sources just this month, it is time to forget what you think you know about peanut allergies. 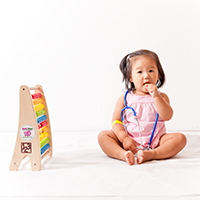 Tribeca Pediatrics has always promoted the notion that introducing your child to solid food should be a fun, enjoyable experience for both you and your little one. After all, despite the hype, real food allergies are actually extremely rare. In addition, according to the new guidelines by the National Institute of Allergy and Infectious Diseases, introducing your child to potentially reactive foods in the first four to six months of life, can actually reduce the likelihood that they will develop the allergy in the first place. So, fear no longer. When you decide to introduce solid foods to your child, feel free to go wild. Try barley, rice, strawberries, gluten, peanut butter, as long as you prepare the food in a way that your child can safely consume it. They may not love everything at first bite, but down the road when your child can order anything they want off a menu, they’ll thank you. If your child does have food allergies, putting off the introduction of the substance will not lessen the eventual reaction, so it’s better to know sooner rather than later. Such food sensitivities most commonly show themselves in a mild rash or loose stools. If this does occur, don’t fret. These reactions are usually mild and short-lived. However, if your little one starts to have trouble breathing, it’s time to seek medical attention. It’s been known for some time that if your baby has severe eczema or an egg allergy that they have a greater chance of being allergic to peanuts. Previously, it was believed that these children should avoid peanuts completely. Now, however, allergists agree that it is even more important to introduce these babies to peanuts in the first six months of life. If your child is at a higher risk of having a peanut allergy, before introducing peanut products in the home, let us help you find an allergist. They can evaluate your child and even test them in a safe, controlled environment. These recent findings and the shift in how doctors and specialists approach food allergies is great news for both parents and kids. Not only is the medical community on the verge of being able to prevent large numbers of cases of peanut allergies, but we can all breathe a greater sigh of relief at meal time. So buy some Skippy, whip up a P.B.&J, sit back, and relax because peanuts are back in the game!